I have had an evolution of views on herbicide resistance as it pertains to spraying. I’ve always believed that if you want to combat resistance with application technology, you need to spray less. After all, herbicide resistance is a direct consequence of relying too much on herbicide sprays. But last year, I read a paper in Weed Science by Parsa Tehranchian that changed the way I looked at things. Tehranchian et al. did a study where they showed that in three generations, sublethal applications of dicamba evolved polygenic resistance in Palmer amaranth. They chose a completely susceptible population of Palmer amaranth and applied sub-lethal doses of dicamba to it, and allowed the survivors to cross-pollinate and go to seed. They took that seed and repeated the experiment at a number of doses, always choosing sublethal rates and picking survivors to again cross-pollinate. After three such generations, they had a GR50 ratio of approximately 3:1. Suddenly, my interest was piqued because I felt that sublethal application is something we could do something about. Spray technology can prevent the repeated application of sublethal doses in the same location. The first way to prevent sublethal rates is with turn compensation. Turning with a sprayer can result in a large variation in application rate. Fields have topographical features, obstacles like sloughs that are repeatedly gone around year after year. When the sprayer turns to go around an obstacle, the inside wing turns a smaller radius than the outside wing. When we go around an obstacle of 60 feet in diameter with a 120-foot boom, the inside nozzle is overdosing by a factor of three and the outermost nozzle is underdosing by about 40 per cent. That may be sublethal. If you do that year after year after year because of a permanent feature, I would suggest these permanent features is where I would look for resistance onset for outcrossing species. independently. As the sprayer is making, say, a right-hand turn, the furthest right nozzle puts out a lower dose and the furthest left nozzle is putting out a higher dose. Turn compensation, coupled to PWM, is commercially available. These systems are coming into the market at $25,000 to $65,000 for a 120-foot boom. Turn compensation provides true, uniform distribution of the spray across the width of the boom, but there are limits to what the technology can do. If you want to go around a stone pile with a diameter of 10 feet, the capabilities of the system will be grossly exceeded. In PWM, the ratio from lowest to highest dose, from the inner to the outermost wing, is about four- to eight-fold, depending on the system. In practice, that means going around an object with a diameter about one-half the boom width. Another element to sublethal does application is called “boom sway and yaw,” which is basically the boom movement up and down and forward and backward as you navigate across a field. This can produce quite variable results. Research by Syngenta in Europe found that improper height and stability of the boom resulted in an 80 per cent loss of performance of a soil-applied herbicide for black grass control. Boom yaw is a forward-backward movement of the boom. If you’re going 10 miles an hour the boom jostles a little bit and the left boom is moving forward faster than 10 miles an hour, and the right boom is moving back. The result is under-applying and over-applying on opposite sides of the boom. Technology from Amazone, a German manufacturer of farm equipment and sprayers, uses an accelerometer to determine when the boom is moving forward and backward. The movement is compensated for with hydraulic cylinders to keep the boom as steady as possible. They have also added on pulse width frequency modulation (PWFM) that also varies the dose to compensate for boom movement. This system knows exactly how fast the boom is moving and gives it a higher dose or a lower dose along the boom as necessary. The system is called SwingStop pro. Using this system, if you drive through a field and your boom is swinging back and forth, you’re always putting on the right dose. However, there is a limit to the technology and that again is the dynamic range that the PWM system is capable of. SwingStop pro was featured at Agritechnica in Hanover in November 2017. We’ve covered two ways that spray technology can reduce the application of sublethal doses, both using PWM: turn compensation and boom yaw compensation. But there are other trends in spraying which are more difficult to correct. One such trend is to drive ever-faster, which creates aerodynamic challenges for uniform spray deposition. The faster the speed, the more fine droplets leave the spray plume and become subject to displacement due to forward motion-induced turbulence. Funded by Western Grains Research Foundation, Hubert Landry with PAMI Humboldt did some modelling of turbulence behind sprayers through “computational fluid dynamics” (CFD). CFD is software that can document, among other things, turbulent kinetic energy – TKE – an indicator of turbulence. At 18 miles per hour travel speed, structural components on the sprayer such as booms and wheels can create significant turbulence. Smaller droplets are doing a lot of the heavy lifting in terms of efficacy. They provide coverage that’s important for contact herbicides, and they can go places in the canopy that larger droplets can’t reach. 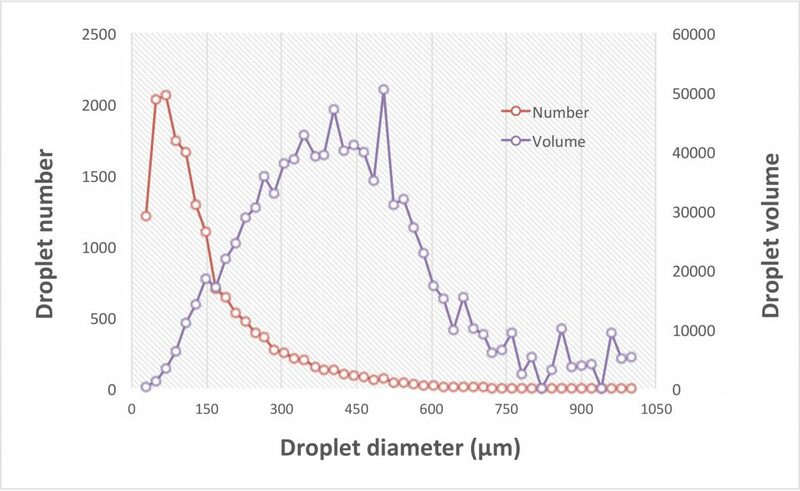 These are also the droplets that are most likely to be displaced because of their small size and low mass. So, we have to understand how to manage that and how to mitigate that displacement. I was with a co-operator in 2016 doing a fungicide trial. When we were done he went to finish spraying a field. He had someone bring a drone and take photos from the air. He was going 27 miles an hour because he wanted to finish the field that day. He left a long plume of fine droplets behind the sprayer. He lost control over those droplets. They were at the whim of the turbulence induced by the sprayer, and could be move up or down or across from where they were intended to deposit. If weather conditions were poor, i.e., windy, then this could make things even worse. That’s an issue. What proportion of the spray volume is actually at risk? It’s a small dose, probably less than 10 per cent, depending on the spray quality. However, this small dose represents the majority of the total number of droplets in the spray. In other words, the ones that provide that elusive and important “coverage” are the ones most affected by turbulence. At Ohio State, we conducted a study that looked at deposit uniformity with a high-resolution analysis of a square metre in bare soil and stubble and with a medium and fine spray. Five-centimetre diameter petri plates were placed at 12.5-centimetre intervals, so there were 64 data points in the square metre. We noticed that the spray was overdosing by 50 per cent and underdosing by 30 to 40 per cent in some cases. We were surprised by the variability but in subsequent studies have come to accept this as normal. We don’t observe problems due to this variability because the label rate over-applies to compensate for the variability. But if, for whatever reason, we are a little bit less than perfect on the application, we are going into sublethal territory. Imagine poor growing conditions that challenge the herbicide performance. Or later growth stages. Or antagonism from a tank mix or poor water quality. In all cases, the label rate protects the user from noticing lower performance. But these conditions do bring us closer to the edge. convex shape. At this stage, the benefit from overdosing is much smaller than the penalty from under-dosing. When we super-impose the typical variability in dosing, such as the one from our Ohio State study, we quickly learn that a variable dose is also a less efficacious dose. 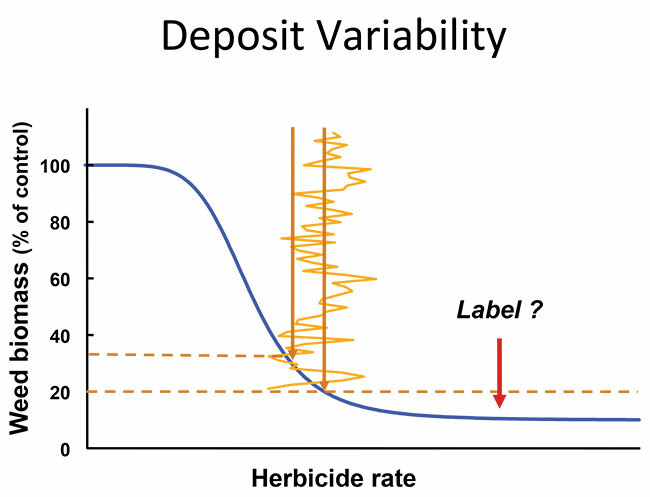 Perhaps the loss of overall efficacy is enough to cause sublethal doses to reach certain weeds, allowing survival that can eventually lead to polygenic resistance development. Boom height and travel speed is one of the areas where we need significant technological improvement. Even sprayers with automatic boom height control have trouble keeping the sprayer boom level to the ground because of faster travel speeds. In 2006, we worked with PAMI to study spray deposit uniformity at various travel speeds and boom heights. The variable deposit uniformity we saw across the boom was improved with slower travel speeds. Spray deposits had higher CVs with higher wind speed. Higher travel speeds resulted in higher CVs. Finer sprays had higher CVs. The move that our industry has made to coarser sprays has been very good. We now need to repeat that accomplishment for travel speed and wind speed. There is new technology that I think is worth thinking about. Tramontana Agro Technologies is a Toronto company who has introduced WEEDit, a system made by Rometron, a Dutch company. A WEEDit boom is equipped with sensors at one-metre spacing. Every sensor has five channels, so the resolution is 20 centimetres. The sensors emit a light that can identify living plants by sensing chlorophyll. If chlorophyll is present, the nozzle directly behind that 20-centimetre section will apply a burst of spray to target the plant that triggered the system. Tramontana has sold five units in Western Canada. It works for pre-seed and post-harvest applications, but is not suitable for broadcast crop spraying because it cannot yet differentiate crops from weeds. WEEDit is also pulse width modulated, and capable of a speed up to 25 kilometres per hour. With PWM, turn compensation is possible, and dose is held constant at most travel speeds. This kind of technology facilitates the delay of the onset of resistance through the tank mixing of effective modes of action because it makes tank-mixes affordable. If you’re only spraying 20 per cent of the field because you have a weed sensing technology on the pre-seed burn-off, a $50 tank mix becomes a $10 tank mix. An Alberta farmer purchased this system in 2017 and uses it on his 15,000-acre farm. He saved $82,000 last year. His average saving was 80 per cent. This system can pay for itself in just a few years, depending on the farm size. It was met with much success in Australia, particularly for custom spray operators. It’s an important system, and it has implications for management of resistance.